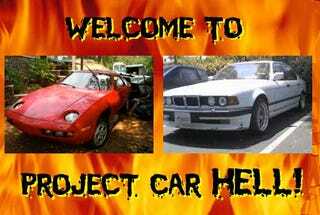 Project Car Hell, Teutonic Nemesis Edition: BMW 750iL or Porsche 928? Welcome to Project Car Hell, where you choose your eternity by selecting the project that's the coolest... and the most hellish! The lowly flatworm can learn to avoid pain, but not us. Even with countless real-world cautionary tales to warn us, we persist in being tempted by terrifyingly complex German luxury hot rods of the 1980s and 1990s. Why, even after having all your fingers roasted down to charred stumps by the merest touch of a cheap Porsche 928 or V12 BMW project, when you see one priced at just a grand… well, maybe you won't get burned this time! That's why we can't help but keep returning to these two fine machines, though we've seen them in the Hell Garage before. Project Car Hell, V12-O-Rama Edition: BMW 750iL Convertible or Pair Of 1946 Lincolns? This is a photograph of one of the Porsche 928's electrical panels. Looks complicated, doesn't it? The sort of thing that might be a bit intimidating when you have to puzzle out the cause behind some bizarre malfunction… but hey, maybe this 1982 Porsche 928 (go here if the ad disappears) will be 100% reliable for you! Just find a new transmission for it- 5-speed, of course- and you'll be well on your way to building your very own lightweight 928 track car. The seller would like to get $999 for it, which means that this Porsche has depreciated a head-clutching 98.8% (adjusting for inflation) since 1982. How can that be? At that price, we suggest you pick up a couple of parts cars, because what are the odds that all three of your 928s will have the same broken stuff? While you're dealing with that pair of cracked heads minor tuneup, you can start shopping for some really cool-looking wheels, because this seller is giving you the opportunity to choose the most beautiful wheels in the world for your new 750il. That's right, "all u need to do is bring some wheels cause it doesnt have any and then u can take it home." Transmissionless 928 or head-gasket-challenged 750il?